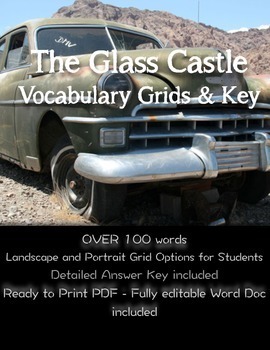 The Glass Castle Vocabulary--Already definded for teacher! 136 words already defined for the teacher! 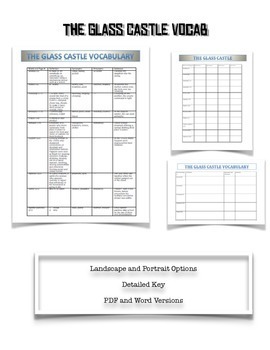 A nice chart that has the vocabulary word and page number in one column, synonyms in another, antonyms in the third and a sample sentence in the last. I also included a landscape option and a portrait option. The landscape option leaves more room for student's to write than the portrait option but you have them BOTH to choose from. There is a teacher's key with all four columns filled in.